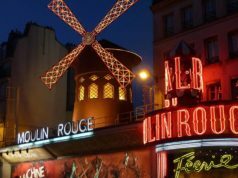 Where better to celebrate Valentine’s Day than in the City of Light and Love? 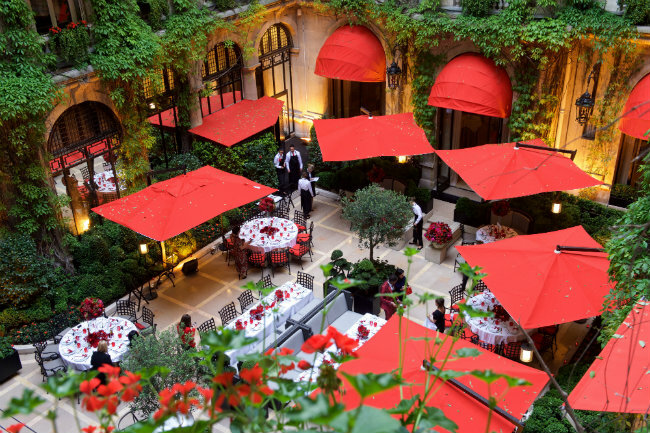 Here we recommend a round-up of romantic hotels in Paris for a perfect getaway. 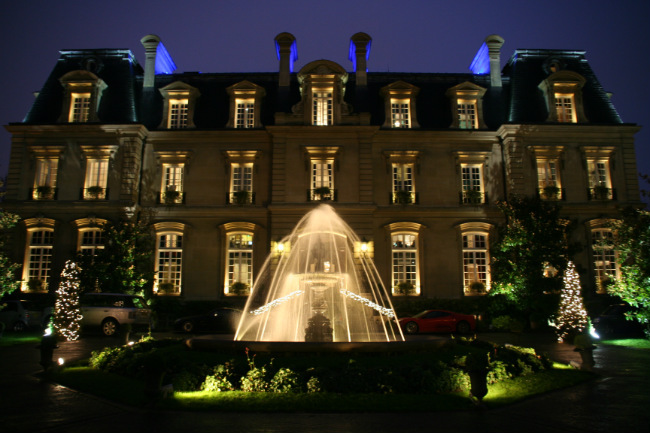 The grand Saint James Paris is the closest thing to a chateau in the city, offering plenty of space, privacy, and indulgent facilities – including a Michelin-starred restaurant, private members bar, and Guerlain spa. 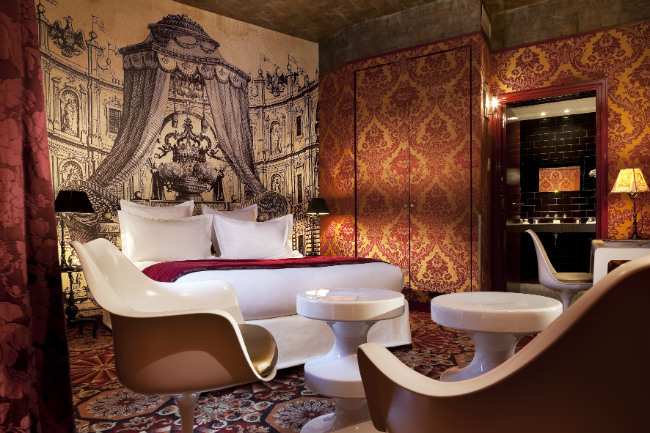 Decked out in Bambi Sloan’s signature “crazy chic” style, the rooms are sensually furnished in an eclectic mix of wallpapers and Toile de Jouy, with tactile fabrics, rich velvets, and the silkiest cotton bed sheets. 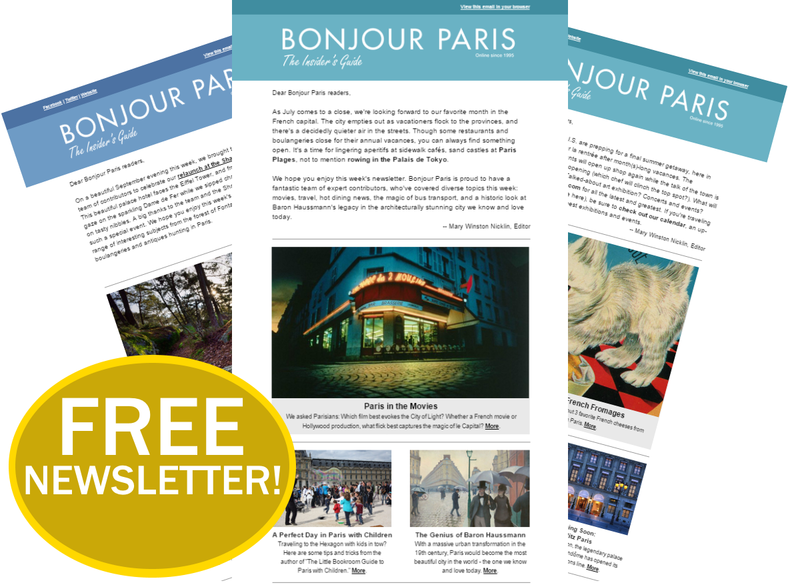 In fact, with all this on offer you might never want to leave the comfort of the hotel during your Parisian séjour. 5 Place du Chancelier Adenauer, 16th. Tel: +33 (0)1 44 05 81 81. 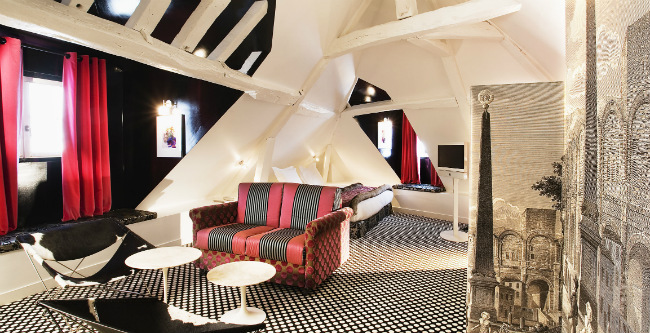 Full of charm and character, this boutique hotel offers just 16 rooms and one suite, all individually designed by Christian Lacroix. 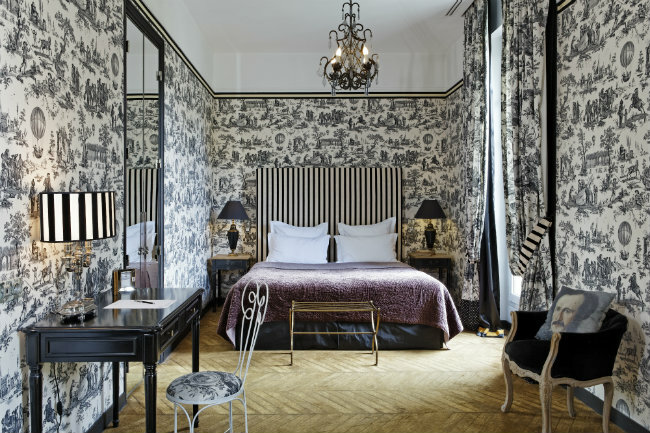 Lavish fabrics, an eclectic choice of patterns – think zebra print and florals – and low lighting make these petite rooms cozy rather than cramped and the perfect place to spend an intimate stay in Paris. Guests looking for some relaxation time can also speak to staff about using the spa at nearby sister hotel Pavillon de la Reine. 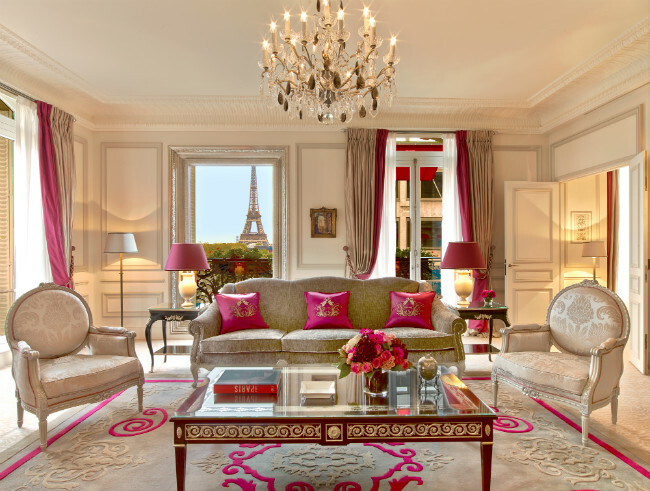 If you really want to spoil your beloved this Valentine’s Day, then the beautiful Hotel Plaza Athénée cannot fail to impress. 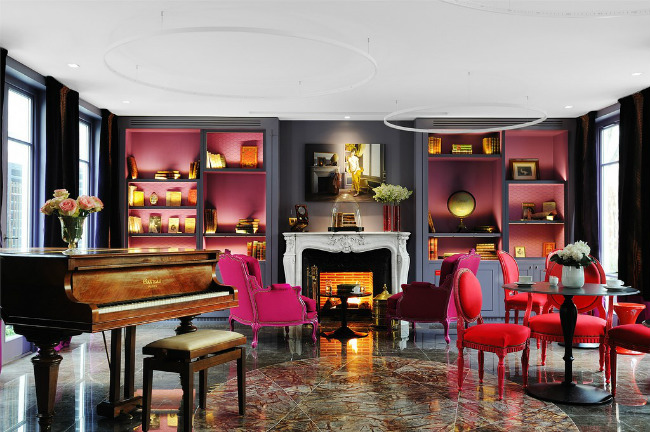 The ornate décor is simply stunning, the service flawless, and the soothing Dior spa downstairs is the perfect place for indulgent pampering, and with a treatment room for two. 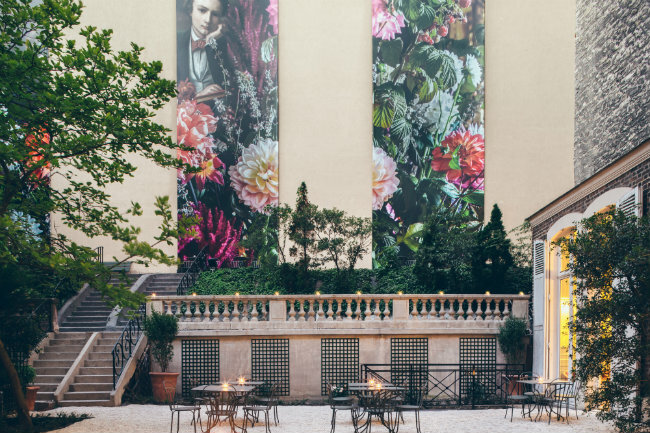 In the evening, dinner at Restaurant Alain Ducasse au Plaza Athénée will make a night to remember, but the oft-overlooked Le Relais Plaza is also well worth a visit, serving up well executed French food in a relaxed, historic setting. 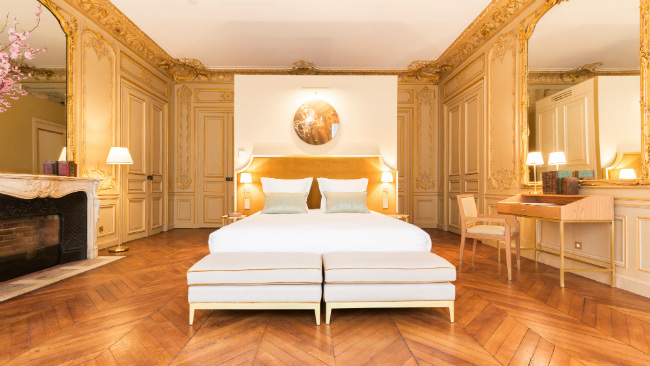 Located on a quiet street in Saint-Germain-des-Prés, the intimate La Belle Juliette has been inspired by the beautiful socialite Juliette Récamier, adding a touch of romance to this small boutique hotel. 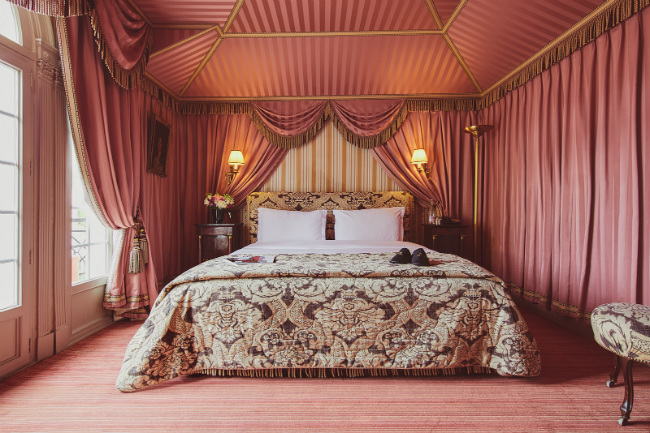 While the newer garden-view rooms offer peace and quiet in a contemporary setting, the classic style of the rooms is well-suited to Juliette’s story, with velvet-clad furniture, decorative fireplaces, and antique-style mirrors. 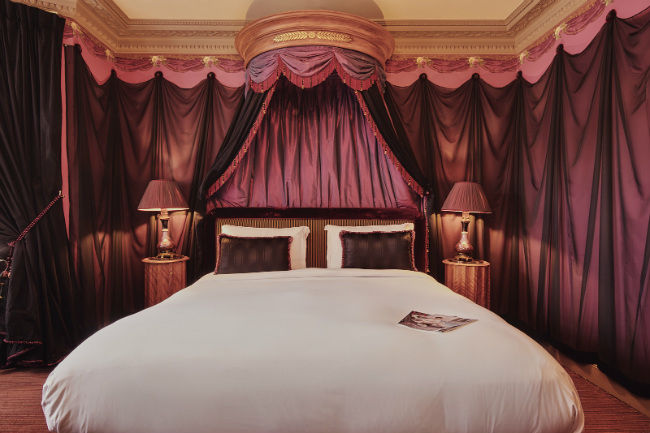 The Boudoir suites make for a particularly romantic stay for couples. Guests can also indulge in some pampering in the spa, and don’t miss a dip in the small heated plunge pool with its atmospheric deep blue lighting. 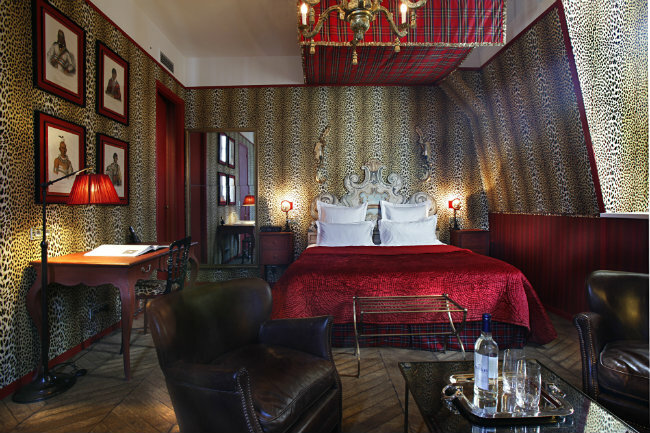 One of the newest additions to the Paris hotel scene, this family-owned former hotel particulier offers an intimate and personal stay– perfect for Valentine’s Day. 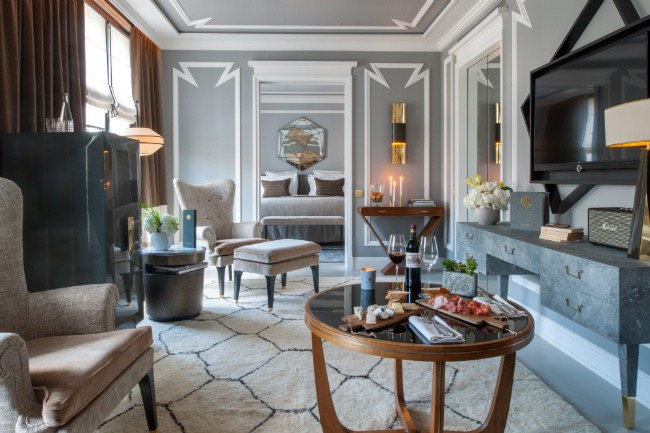 The elegant but luxurious decor boasts original design features such as exposed beams, painted trumeaux, and ornate decorative fireplaces for a truly Parisian experience, while a night in the magnificent Suite Alfred Sommier will feel like being in your own private chateau. 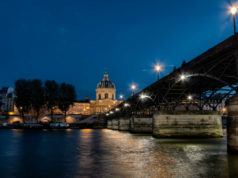 Downstairs, Franco Miotto and his sous chef Gladys Grasset, who both cut their teeth at Paris’s palace hotels, serve up a selection of classic French fare, with a special Valentine’s menu to be held in the hotel’s candlelit, gilded gold Salon doré. 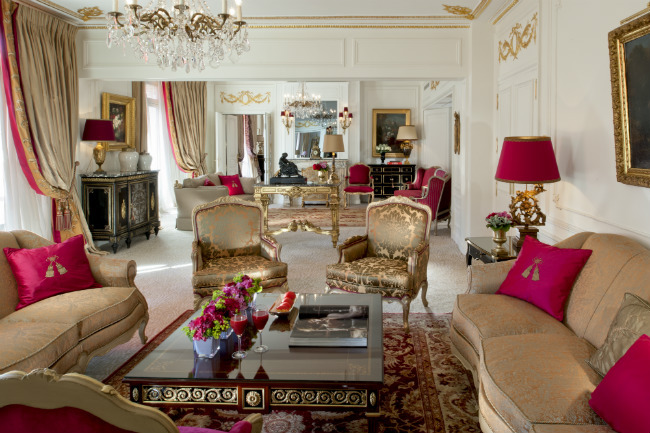 Just 20 rooms make L’Hotel Paris’s smallest five-star hotel, with all lavishly furnished in rich jewel colors, velvet furniture and heavy drapes, with huge beds and tubs made for soaking. 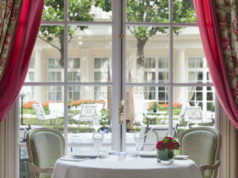 Guests can also enjoy Michelin-starred cuisine in the restaurant, and soak up the rich history of the hotel while sipping on some of the best cocktails in Paris in the bar area. Hidden downstairs is also a secluded hammam pool, steam room, and treatment room which can also be reserved for absolute privacy. 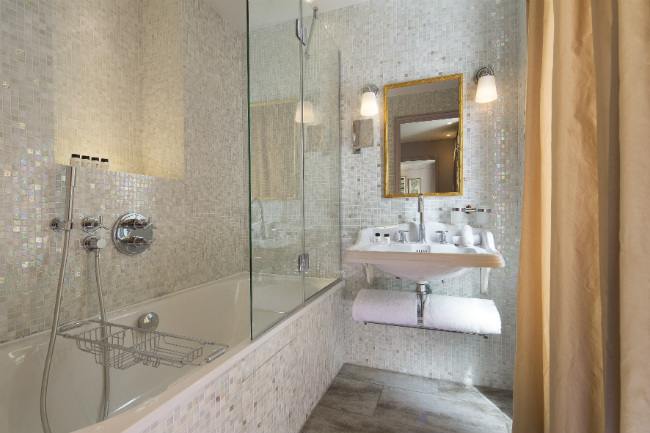 A modern take on luxury, Nolinski’s rooms and suites feature mix and match fabrics, custom-made furniture, sculptural light fittings, and sleek bathrooms – and all finished in a unique color palette of green, raspberry, blue, yellow and fawn. 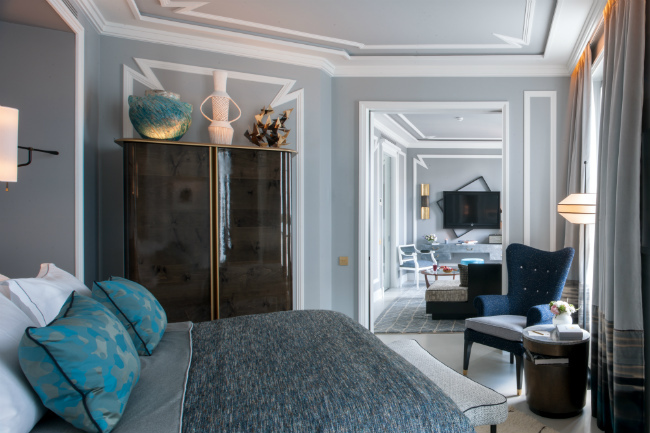 The suites are designed to evoke a private apartment, so perfect for a couple’s stay, and all windows and balconies open out on to Paris so you can make the most of the romantic city. The hidden spa also boasts a gorgeous candle-lit pool where you can swim under a mirrored ceiling.